You can also download a PDF of this report by clicking here . Contribution to Strategic Outcome 2: Individuals and groups feel better connected and are able to contribute to public policy and the planning and delivery of local services. Contribution to Strategic Outcome 3: Groups, whether already established or just getting started, have the tools they need to engage with their local community in a positive and inclusive way. 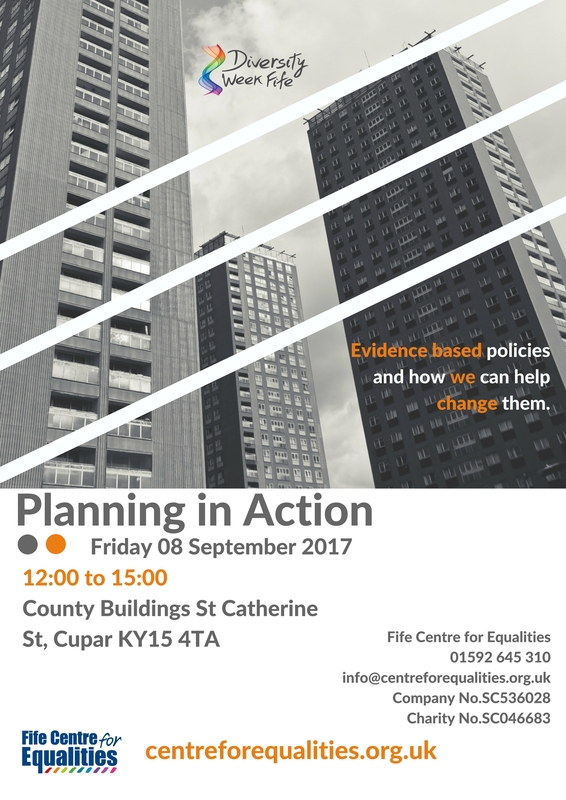 Contribution to Strategic Outcome 5: FCE is recognised as a centre of excellence for championing equality, diversity and social justice. 1245 Activity 1: Table Discussions – Place Standard: How good is NE Fife? The session was introduced by Sheena Watson, NE Fife CLD Team Leader, led by Elric Honore, FCE and table discussions led by NE Fife CLD team. The Place Standard questions were grouped under the following headings in order to run the event with 5 tables lead by a facilitator leading the themed conversations with the specific task of identifying. Moving around: Can I easily walk and cycle around using good-quality routes? Public transport: Does public transport meet my needs? Traffic and parking: Do traffic and parking arrangements allow people to move around safely and meet the community’s needs? Streets and spaces: Do buildings, streets and public spaces create an attractive place that is easy to get around? Facilities and amenities: Do facilities and amenities meet my needs? Natural space: Can I regularly experience good-quality natural space? Play and recreation: Can I access a range of space with opportunities for play and recreation? Work and local economy: Is there an active local economy and the opportunity to access good-quality work? Housing and community: Do the homes in my area support the needs of the community? Social contact: Is there a range of spaces and opportunities to meet people? Influence and sense of control: Do I feel able to take part in decisions and help change things for the better? Identity and belonging: Does this place have a positive identity and do I feel I belong? Feeling safe: Do I feel safe here? Care and maintenance: Are buildings and spaces well cared for? Facilitators were tasked with keeping the discussion focus on the allocated themes; participants use the 1-7 ranking system if that was found useful to get more participation, while the main outcome remained identification of barriers to equality. Seems to be a reasonable number of opportunities for those with differing abilities. Kilmaron School has a lot of ties to the rest of the community. Having a meeting space for young people, like the youth café plays a good role, rest is paid structures like rugby etc. It’s very segmented, there is nowhere all ages an meet together. We could really do with more sheltered spaces in the community to meet. Active local economy – that depends on where you live, e.g. in Cupar large employers are the one that take all the profits which doesn’t help the local economy. Places like the sport centre & YMCA offer opportunities to meet others to in a group format, but this can be daunting to many, and segregates the ages. It’s difficult to meet at all – in the evening there’s no places open at all and that’s the only time after schoolwork etc we could be doing something. I got involved with the local community council, I’m the youngest person there but it took a long time to get accepted even to go attend and longer to become a recognised (full) member. NE Fife varies; some places (Newburgh) are inclusive and now have a town attitude rather than rural – it draws people in. People move away for work or uni – is there anything to draw people back? Tayport is the best kept area but the people who made it thus are getting old, they started the journey a long time back. As generations move on what generations are there to replace them? There’s opportunities for people stepping in and filling the void – mainly in school and for those retiring. Follow up event at Cupar Youth Café – youth forum? 19 people attended this workshop representing the following organisations. All participants (100%) found the event helpful, with the most useful aspects being “having a chance to think about my local area”; “range of group discussions”, “being able to voice my opinions” and “understanding more about my community”. Suggestions to make the event better included having “more time for unstructured discussion”, “the event held at different locations in Fife”, and “bring more participants focused around 1 specific theme”.